Thomas Dunne Books, 9781250001474, 320pp. In 1982, in Ocean Springs, Mississippi, Chris Strompolos, eleven, asked Eric Zala, twelve, a question: "Would you like to help me do a remake Raiders of the Lost Ark? I'm playing Indiana Jones." And they did it. Every shot, every line of dialogue, every stunt. They borrowed and collected costumes, convinced neighborhood kids to wear grass skirts and play natives, cast a fifteen-year-old as Indy's love interest, rounded up seven thousand snakes (sort of), built the Ark, the Idol, the huge boulder, found a desert in Mississippi, and melted the bad guys' faces off. Along the way, Chris had his first kiss (on camera), they nearly burned down the house and incinerated Eric, lived through parents getting divorced and remarried, and watched their friendship disintegrate. 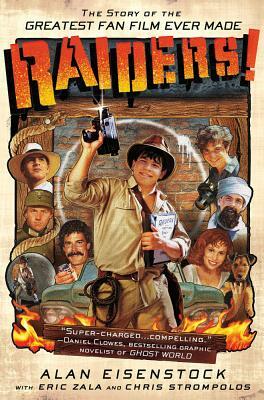 Alan Eisenstock's Raiders! is the incredible true story of Eric Zala and Chris Strompolos, how they realized their impossible dream of remaking Raiders of the Lost Ark, and how their friendship survived all challenges, from the building of a six-foot round fiberglass boulder to the devastation of Hurricane Katrina. ALAN EISENSTOCK is the author of several non-fiction works, including THE KINDERGARTEN WARS: The Battle to Get into America's Best Private Schools, TEN ON SUNDAY: The Secret Life of Men, and SPORTS TALK. He lives in Pacific Palisades, California. “The mother of all fan movies.